Seattle Beverage and Liquor Law Frequently Asked Questions | de Maar Law As a beverage distributor, what can I do if a supplier moves to a new distributor? If you are a beverage distributor and your supplier has chosen to go with a new distributor or you are a supplier who feels your distributor is not holding up its end of the bargain, check your contract! You may be owed damages due to a breach of contract or alternatively be able to get out of your current distribution agreement if you follow the proper procedure. We see this all the time. A distributor thinks it has a solid agreement with a supplier and then the supplier suddenly switches to a new distributor. The first question we ask is, “Did you have a written distribution agreement (also known as a contract)?” Often times, distributors believe that if the supplier is a craft distiller or otherwise exempt from statutory protections, they have a remedy for the loss of the brands. However, if you have a written distribution agreement, both parties are still bound by their contractual agreement. So, what does your contract say? We understand that many of these supplier-distributor agreements are made without the input of an attorney, but we are constantly surprised by how often the two parties sign contracts without knowing what the contract stipulates and what each party is agreeing to. Feeling that your supplier is not treating you fairly means nothing if the contract does not protect you from the unfair treatment. If you do have a distribution agreement, however, it is worth consulting with a beverage law attorney to determine if the supplier has breached the contract. 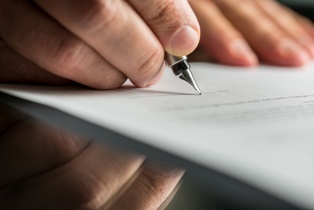 For example, if the contract outlined requirements for giving notice of termination and you were not formally notified that the supplier intended to end the relationship, you may have a case for breach of contract. Another possibility is if the contract allowed for an opportunity to cure—which a good contract should do. This means that if the supplier believed its distributor was not living up to its promises under the distribution agreement, it is required to give you an opportunity to fix the alleged problem. If you do have an opportunity to cure clause in the contract and you were not given that opportunity, you may also be owed damages under a breach of contract claim. It is important to understand that, even if a distributor is not entitled to distribution rights under RCW 19.126.040, they are often entitled to damages for breach of contract when a supplier switches distributors.